Currently our absolutely favorite dessert wine is the Madeira from V. Sattui Winery in St. Helena, CA. This madeira is a fortified wine produced with a solera system that blends wines of varying ages. The oldest wines in this blend are over 120 years old. This process of blending younger wine into older wine results in very consistent, high quality wines that all share a portion of the oldest, original vintage of wine made at the estate. This is why many fortified wines do not have a vintage date, per se, as they are really a blend of many years. The wine is sweet and has flavors of almonds, caramel, and toffee. It shares similar characteristics with a 20-year-old Tawny Port. You can purchase this wine by mail-order HERE. Vin Santo is translated literally as “Wine of the Saints”. V. Sattui's Vin Santo is the best out of all the bottles of vin santo we've ever tasted. This dessert wine has hints of honey and caramel flavors, and a nice amber color. This particular vintage is aged for up to five years in sealed barrels. It appears that V. Sattui doesn't currently have any Vin Santo in stock. So you'll just have to wait until they make some more. 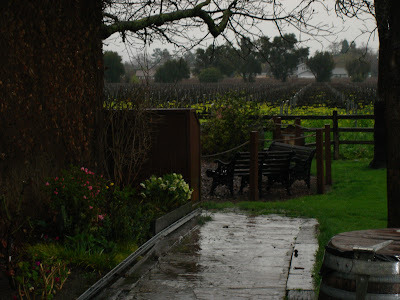 We tasted the 2008 Pinot Noir during our previous visit to California. It has a medium body with a slight aroma of cherries. We ordered a case of the 2009 Pinot Noir for our futures this year, and I'm looking forward to picking up my case when it's bottled. Petite Sirah is a big full-bodied tannic wine with a spicy, plummy flavor. I find most Petite Sirahs to be such a thick and dry wine that it has to be sipped slowly and enjoyed over a period of several hours with plenty of ice water in between sips. Don't let that deter your interest though. This wine tastes wonderful, and I find that it actually helps me enjoy the wine more because I can't just guzzle it down quickly. This was the last case of wine that I bought as part of the futures purchase program. V. Sattui Winery does not distribute their wines through resellers, so you won't see their wines in any wine store. You can only purchase their wines directly through their on-line store or in their St. Helena winery. 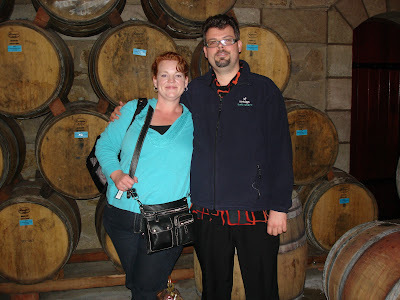 I have been visiting V. Sattui for about 12 years, and I would like to share one of their best-kept secrets. V. Sattui has a Futures Purchase Program that allows you to sample the wines while they are still aging and before they’re bottled. If you like a particular wine early in the maturation process, you can purchase the wine by the case with a 50% deposit, and receive the wine at a reduced price than when the wine is bottled. V. Sattui also offers a special private members-only tasting room where you are given special attention by on of their staff members. In my opinion, the futures program and the private tasting room make V. Sattui one of the most unique wineries in business today. V. Sattui gives you the same attention that you can get at much smaller wineries with the years of experience that only an old winery can offer.